I wish I could tell you that I had willpower made of steel, the discipline of a soldier and self-control of a saint. But it's simply not true. Yes, I'm a fitness professional and a nutrition habits coach, but I'm human too. Even when we know what to eat, it still can be hard to execute, even for me. That's how life works. So how do I make healthier choices most of the time? I start by setting up my environment for success. You see, if I had to rely on willpower and motivation, I'd be screwed. 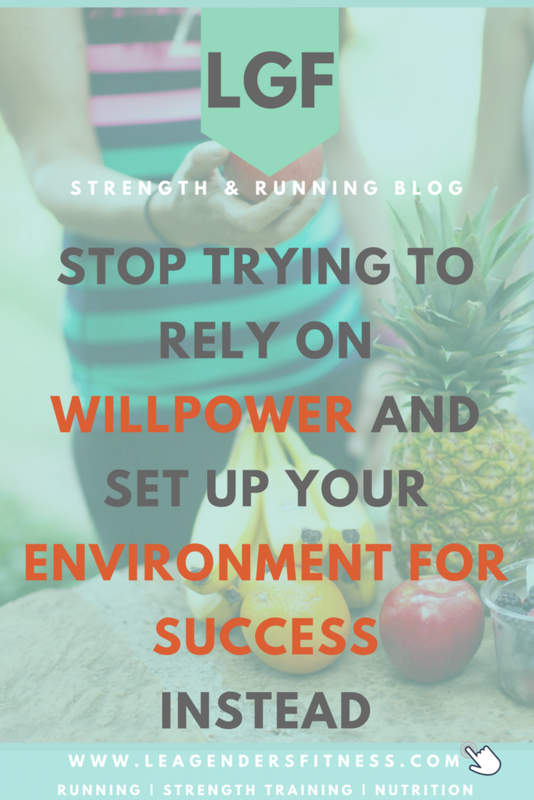 forget about willpower, how to set up your environment for nutrition success. Save to your favorite health and fitness board for later. The first step is to look around your kitchen for the foods that don't fit within your goals. If there is a bag of vinegar and sea salt potato chips in my pantry, I am probably going to eat them. Probably the whole bag. Even though intellectually I don't want to, even though I know it won't get me closer to my goals, even though I said I wouldn't. However, if I don't buy the chips in the first place they won't be in the house, then I won't eat them. Local group fitness trainer Dave Fannin calls it the "Don't Buy It Diet." <-- brilliant. I've been doing this for a long time, thanks to Dave for putting a catchy name on it. Get rid of the foods you don't want to eat. If it's not there you won't eat it. Make unhealthy foods inconvenient to eat by not having them around. Read more on how to clean out your pantry for success in the pantry clean-out challenge. Identify red flag foods. Red flag foods are foods that you have a tendency to lose control over. Once you start you can't stop. For me, it's those vinegar and sea salt potato chips. I had a funny conversation with my sister last time I visited my hometown. We were in the store together and she bought a small bag of those Bit-O-Honey candies. I asked her if I could have one and she said no. She said if she opened the bag now to give me a piece, then she would end up eating the whole bag. She didn't want to open it. She suggested I just buy my own bag since we were still in the store. I explained I didn't want to buy my own bag because I just wanted one piece, if I bought the whole bag, then I would eat the whole bag. I just wanted one piece, not the whole bag. We had the same problem, we both knew once the bag was open that we wouldn't be able to stop eating them until they were gone. That's when Dave's The Don't Buy It Diet works best. If you know you don't have control over a certain food then it may be a red flag for you and it's best not to buy it at all. Just so you know it is not your fault, really. Processed foods are purposefully manufactured to be highly palatable so you won't stop eating. Lays told us first with their advertising campaign back in the '80s, "Bet You Can't Eat Just One." No, Lays, I can't, so I guess I won't be buying any. Thanks for the warning. Haha. Real life is always going to have temptations and if you completely deprive yourself of any food enjoyment you'll be miserable. The key is knowing that there may be certain foods that are red-flag foods and either choose not to eat them at all or in controlled portions. For example, If I really want those chips I may buy a single serving bag instead of a family-sized bag. Even if you eat something that is less than healthy, you can minimize the impact by eating those foods in proper portions. One portion of an unhealthy food is not going to ruin your progress. I live by the 80/20 rule. Healthy nutrient-dense foods 80% of the time leaves 20% room for treats and indulgences. When people hear meal prep, they think of seven lined-up Tupperware dishes of portioned chicken and broccoli, but meal prep doesn't have to be so structured...or boring. How can you make meal prep work for your lifestyle? Meal prep is preparing anything in advance to make it easier for yourself when it's time to eat. If you have easy-to-prepare meals ready to go, you're less likely to order takeout or hit the drive-through because you're too tired to cook. Meal prep may mean cooking two pounds of skinless chicken breast on a Sunday afternoon to use in meals during the week. It may mean making mason jar salads for the lunch week in advance or prepping overnight oats for breakfast. It may mean chopping veggies in advance so they are ready to throw in the frying pan at dinner or making extras at dinner so you have leftovers for lunch the next day. The idea is to prep some food in advance to make it easier to make healthier choices at meal time. It's another way to set up your environment for success. If you plan ahead, then when you feel tired, hungry and frazzled, you're more likely to make the healthy choice if it is also the easier choice. Make healthy food easy and attainable and unhealthy food inconvenient. Brainstorm some ideas that you can do to make your life easier at mealtime. How can you make meal prep work for you? Put a fruit bowl on your dining room table, portion out bags of almonds or pistachios, chop and wash veggies and keep them in the fridge. When you want a snack it becomes more work to put on pants, get in your car, drive to the store to buy something unhealthy. Instead, make it incredibly easy to reach for a piece of fruit or another healthy snack. Our natural tendency is to do what feels easy, so if you make the healthy food the easier choice, you're more likely to follow through. The people you spend time with are a big part of your environment, so if your family likes to order pizza, your friends like to go to the bar to socialize and your co-workers take smoke breaks instead of walk breaks, it can be more difficult to get your environment lined up for success. Since you can't control other people's behavior, you have a few choices. If someone else in your family brings home food that you don't want to eat, explain your goals and your potential struggles and ask them to support you by keeping it out of sight. You can try to encourage your family and peers to adopt healthier behaviors and be a healthy role model. Even if they are not onboard at first, often once they see your positive results, they will start to come around. If not, then open up your circle to people who are on a similar path as you. Of course, I'm not suggesting you leave your family in the middle of the night, dump your friends and quit your job, but instead try to introduce new people into your life that have similar goals and priorities. You can meet like-minded people at health clubs, fitness classes and free community social runs. Online groups and social media pages are a great way to interact with people on a similar path. They say we are the sum of the five people we spend the most time with, when you surround yourself with healthy people, you're more likely to live healthier. Try to find a healthy support system in person or online. With technology, it's easier than ever. It all comes down to setting up your environment for success. Make healthy choices convenient and unhealthy choices inconvenient, then we're more likely to reach for the easy healthy choice. It's true what they say, if you fail to plan, you plan to fail. None of this is easy. It doesn't come easily or naturally to me either. It takes mindfulness and work. If you need help building healthy nutrition habits from the ground up, my nutrition habits program may be a good fit for you. Forget extreme diets and detailed meal plan, forget measuring, weighing and counting the calories of every morsel you eat. Learn to listen to your body, make the right choices for your body type and eat to feel your best and support your goals. The program is fantastic, but it is not for everyone. Fill out this form to see if you would be a good fit. I am offering the first month at 75% off to try. No commitments, except your personal commitment to give it your all. No hassle cancel if you change your mind. We will still be friends.